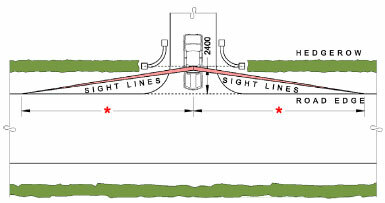 In the interest of road safety when applying for planning permission, the applicant must show clearly on a drawing, the available sight lines in both directions at the junction of the access to the proposed site with the public road. This is particularly relevant where sight lines and site access is restrictive. If the sight lines available are not greater than the required distances under normal circumstances, this can cause a significant stumbling block in achieving planning permission. Sight line measurements must be taken from a point 2.4m back from the edge of the public road and the sight line must be measured to the inside edge of the road. If the required sight lines can not be achieved there are some measures that can be taken. For example, if the applicant has control over boundary ditches or heavy vegetation which restrict visibility, these can be removed. If this is not possible or does not significantly increase the sight lines, then the possibility of reducing the actual sight lines required must be explored. The required sight line or sight distances can be reduced by proving that 85% of the vehicles, passing the proposed site, travel slower that the legal speed limit. 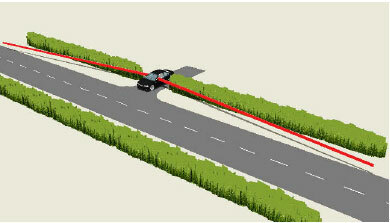 In order to demonstrate this and implement a reduced sight line, then a speed survey needs to be carried out. Based on the design speed of the road the driver exiting will need to be able to view oncoming traffic for a safe distance in both directions, this line of vision is referred to as the sight line. It is measured at 2.4 M back from the edge of the road, this approximates to the position of the driver in the car. This set back distance needs to be increased to 4.5M in the case of a combined residential and agricultural entrance. A speed survey of 200 vehicles, 100 vehicles travelling in both directions, must be recorded to ascertain an appropriate design speed for that stretch of road. Here at Declan Noonan & Associates we have the appropriate experience and insurance to complete this survey for you. We use a radar gun to record the actual speed traveled by passing vehicles. It is the most accurate speed measuring equipment on the market, ensuring that our survey will stand up to the closest scrutiny. The sight distances or sight lines required at any point are dervied from the design speed of the road at that point i.e. in accordance with NRA: DMRB requirements. Speed surveys can be undertaken to record the design speed of any road or section of road. The design speed is the highest safe vehicular speed for which the road is designed to accommodate and is not always equal to the speed limit. The design speed is the speed at which 85 percent of traffic travel below and can sometimes be significantly less than the speed limit. For some planning applications it is necessary to demonstrate that the speed traveled by the majority of vehicles is slower than the legal speed limit in order to justify reduced sight lines. The objective of speed surveys is to calculate the design speed of the road. This situation might arise on a bendy local road, where an 80kph speed limit applies, yet the bendiness of the road reduces vehicular speeds to such an extent that the majority of vehicles travel at a reduced speed of 40kph. In this instance it may not be possible to achieve 160m sightlines in both directions, and a speed survey can establish the actual design speed and hence the precise level of visibility which could reasonably be provided. Declan Noonan & Associates recently completed a speed survey for a client who was applying for planning permission for a new build. The site is located on a rural road. The planning authority sent a Further information Request regarding the sight lines for the proposed entrance to the site. As a response to this we submitted a speed survey to demonstrate that the sight lines outlined in the planning application drawings were suitable for the site. 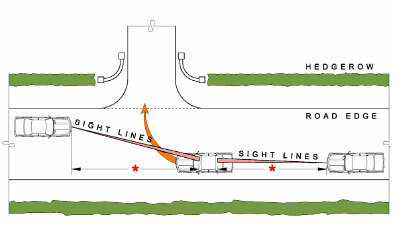 Legally, the required sight lines in each direction depend on the design speed of the traffic on the public road. In the absence of measured speed information the design speed for this site is based on the statutory speed limit on the approaches, which in our clients case is 80Kph. This necessitates a junction sight distance or sight line of 150m in both directions. This would have been inachievable for our client because of the location of the site. However, because the public road approaching the site is narrow and restrictive, we expected that the actual speed vehicles travel this road to be much lower than the legal speed limit. Where speed measurements are available, the sight distance is based on the 85th percentile speed, which is the speed below which 85% of vehicles travel. Declan Noonan & Associates carried out a speed survey of the traffic on both approached to the proposed access. This involves surveying 200 vehicles and recording their speed, 100 in each direction. The speed survey analysis for this particular site indicated design speeds of 56Kph North-East bound & 57Kph South-West bound. The traffic volumes were very low with a total count of 100 vehicles in each direction in 1 time period totaling 8 hours. Table 7/1, Section TD 41-42/09 of the NRA Design Manual for Roads and Bridges (DMRB). Analysis of the data collected during the speed survey suggested a sight distance requirement (y-distance) of 90m in each direction. This should be available from a distance of 2.4m (x-distance) from the metal edge of the road. In this case the sight distance to the right (North-East) was restricted by a section of the existing stone and sod ditch and mature vegetation which bounds the public road. Sight distance to the left (South-West) was restricted by the same section of the existing stone and sod ditch which bounds the public road. Following a site inspection it was clear that a sight distance of 100m to the right and and 150m to the left could be achieved by the removal of these restrictions. As a response to the Further Information Request from the local planning authority we submitted the collated data from the speed survey, drawings demonstrating the ditches to be removed by the applicant and the new acceptable sight lines. As a result planning permission was granted. *Distance/length of unobstructed clear vision required. This distance/length is determined by the design speed for the section of road containing the access. Forward and rear visibility need to be considered in order to ensure that the car waiting to turn in can be seen from a safe distance by a car approaching from the rear or in front. If you have a problem with a site location that is deemed unacceptable by the Roads Department of your local planning authority we can help. The Roads Department primary aim is to protect road safety. However, they will usually work with the applicant to create a workable solution to the problem. Through our technology and know how we can make a site, otherwise unsuitable to the Roads Department, now acceptable through reasoned justification backed up by hard facts. We made the investment in technology as we have seen many applicants lose out on their dreams through lack of effort, knowledge and technology. Since we made the investment in a top of the range speed gun, we have helped many people realise their plans for a new home. We use the speed survey to prove to the Roads Department that a ‘one size fits all’ approach is not always very accurate. By providing case specific information this allows the Roads Department to grant permission for the new access/entrance point to the proposed site. * Distance/length of unobstructed clear vision required. If the road being accessed is not flat for the appropriate sight line distance on either side, then vertical sightlines need to be considered and demonstrated to the Planning Authority. * Distance/length of unobstructed clear vision required. Vertical visibility impaired by contour of the road, sight line not achieved.